This is my favorite time of year for sure. While I love certain things about fall, winter, and summer; spring is definitely my favorite. With spring comes the urge to spring clean! I have been on such a tangent to get our house clean and organized. Mostly because I can’t stand clutter, and so many things need to be cleaned! 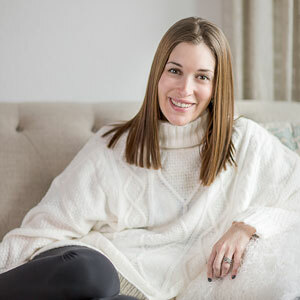 Today I am sharing the things I am doing and 5 things you can do to get ready for spring! Switch your clothes out: I am really bad about having ALL my clothes in my closet at once and honestly it makes me crazy. It feels cluttered and messy. So this year I am NOT doing that. I am switching my closet over from winter to spring. In doing that I realized how wrinkled so many of my spring and summer things were. This is also a good time to steam those clothes to keep them nice for when you want to grab and wear them. 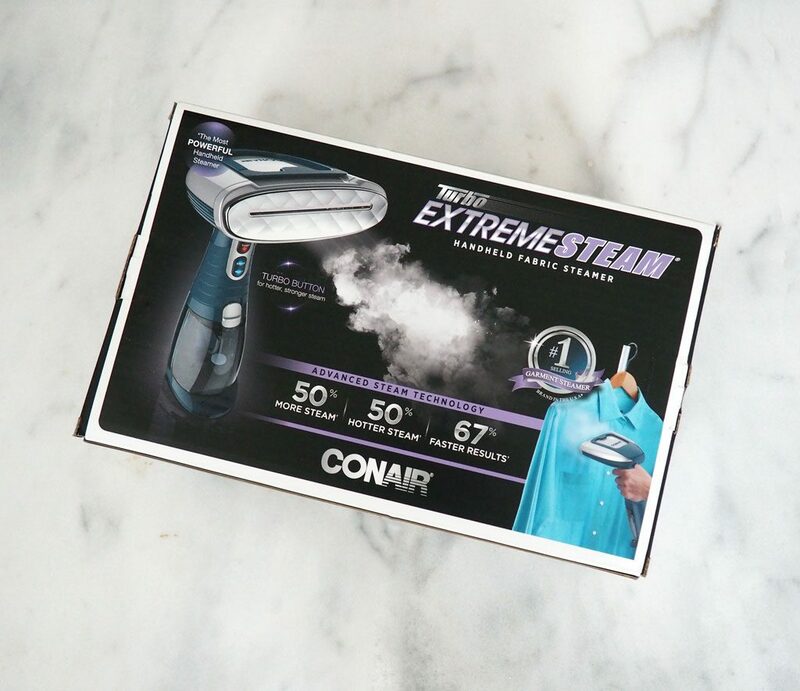 I am LOVING our new CONAIR® TURBO EXTREMESTEAM® HANDHELD FABRIC STEAMER. It’s super easy to use especially for someone like me who didn’t have a TON of steaming experience. It heats up really fast and holds enough water to steam a ton of clothes. Clean linens: It’s amazing how often we forget to clean our linens. We all wash towels and sheets often, but what about throw blankets? Comforters, etc. 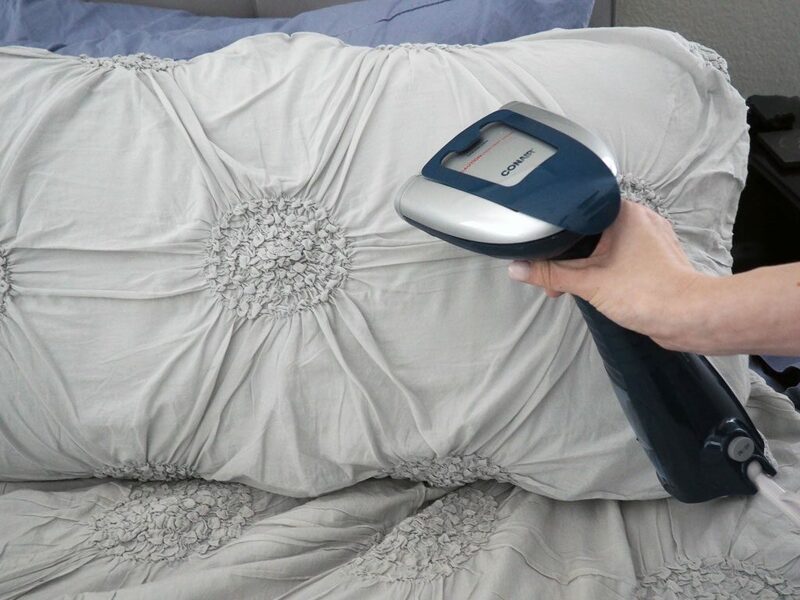 Or even to steam clean your pillows? 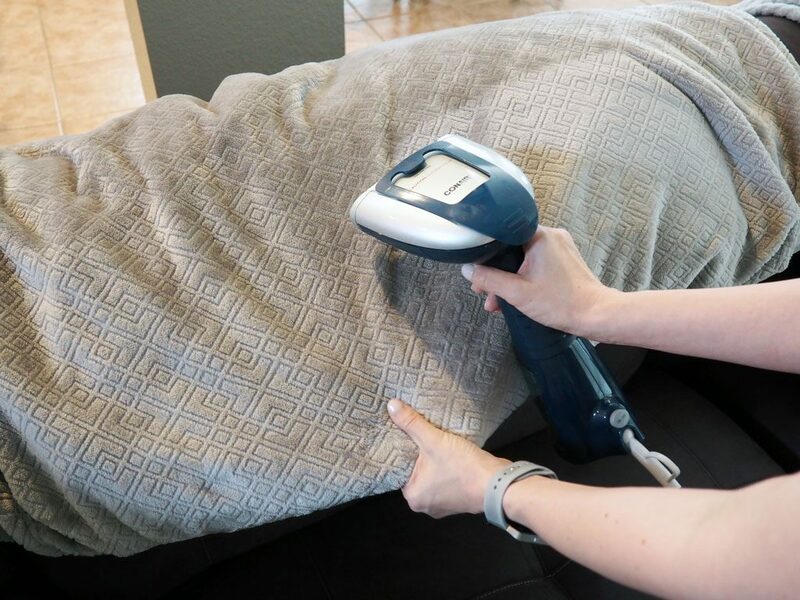 The Conair turbo steamer is perfect for this as well! I steamed all of our blankets after washing them, the same with our coverlet and shams! Now everything is fresh and clean for spring! Put things you aren’t using right now away: For example, we have a ton of baby items, clothes Liam has grown out, etc. We have them all packed away in our attic. The same with seasonal decor, or things you just don’t need right now but will need later. It clears out SO MUCH clutter! Donate: If you have cleaned out every nook and cranny you know you have stuff you either don’t and won’t use or don’t need. So donate it! You can get a good tax write-off while letting your unused items find new life. Win-win! Deep clean: There are a few places in every house that can be easily overlooked: The fridge and freezer, light fixtures and fans, and of course furniture. This is the perfect time to empty the fridge and wipe everything down, the same with going through your pantry and freezer and throwing out expired foods, or things you no longer want. You can even donate foods that haven’t expired but you may not use in time! 40-second heat-up – great for the gal (or fella) who may only have a few minutes to get things steamed! 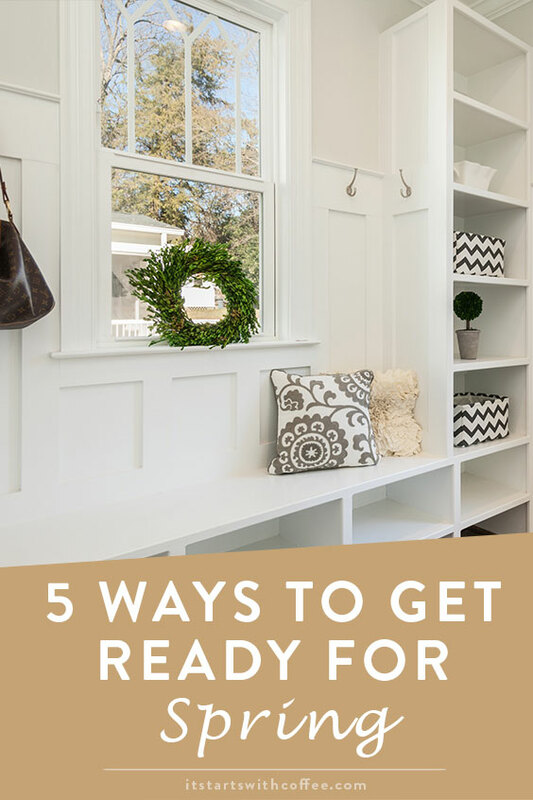 I hope these 5 ways to get ready for spring were helpful and give you an idea of a few things you can do to get yourself (and your home) ready! This post is brought to you by Conair. All opinions are my own. Thank you for supporting the brands that support It Starts With Coffee. Oh, I’m the same about having all my clothes in my closet, no matter what season it is. It’s hard to store certain items away simply because I live in a tiny 300 sq ft apartment, so there’s no place else to stash them out of sight! This means it’s time for decluttering! I’m so ready for some warmer weather. I tend to move around my clothes based on the season! It’s handy. Must really get that steam will save time and money when travelling,not to mention going out with my clothes well straightened everyday. I’ve been looking at hand-held steamers. Our couch could use a good cleaning and it seems like it would work well. Ooh! I want one. I have a small travel steamer but this seems more powerful for cleaning. Been on the search for a good steamer! Thank you for sharing. Excellent tips and I am ready to welcome spring sunshine with open arms! A steamer would be great for our oversized comforters in between costly dry cleanings. I always switch my clothes around as we have extremes of weather here in Umbria, Italy. I have a winter set of clothing, a summer set of clothing and my ‘inbetweenies’ for spring and autumn when it is not quite cold enough for a sweater but not warm enough for a short sleeved top. I NEED that. I have a cheapie steamer that I got a few years ago, and it’s only shown me how much I could benefit from a better quality model. It’s such a handy tool to have! I need that steamer in my life in the WORST way! 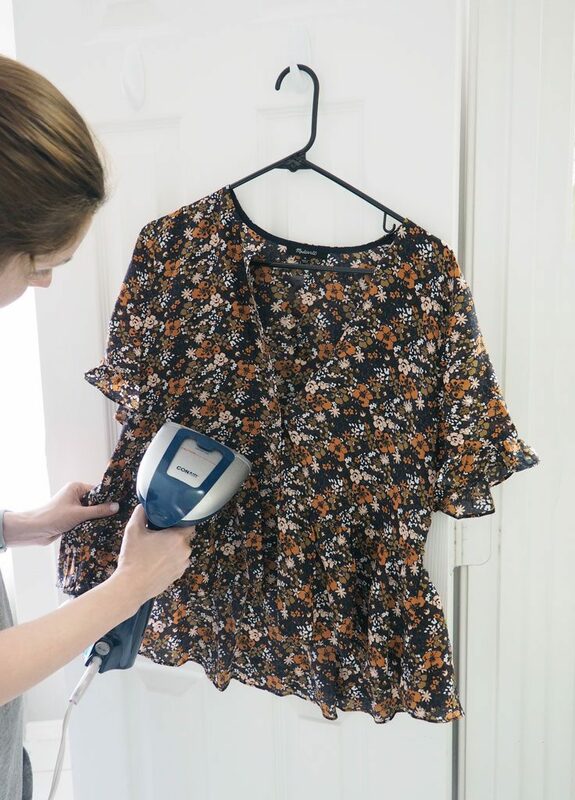 These tips are great and I’ve actually been on the lookout for a steamer, thanks for sharing this one! Love these tips!! I’m trying to swap out my clothes seasonally too but I find it’s so hard!! One of the things I want to work on for sure! I am so ready for spring. However, my home is not. Thanks for the nudge to get started. These are great ways to get ready for Spring, now if only Mother nature would start preparing too! It’s still so cold in our neck of the woods. These are great suggestions! I for one am so excited for spring and warm weather to arrive, so we can spend plenty of time at the park. I enjoyed this post! You wrote a lot of good suggestions and I definitely think that I need to check out that steamer! Gotta spend this weekend for cleaning and switching clothes. Thank you for the suggestions! That hand steamer is so cool!